Visit the Polar Bear Capital of the World – Churchill, Manitoba – for a once-in-a-lifetime chance to witness the great polar bear migration. In October and early November polar bears congregate at Cape Churchill, waiting for the ice to form on Hudson Bay. Once the ice is stable, they are off for the seal hunt! This is your best opportunity to see these magnificent creatures up close from the comfort and safety of a custom-built Tundra Buggy vehicle. Get your cameras ready, this is a must-see for wildlife enthusiasts. Have you ever heard of Buggy Love? As polar bear enthusiasts your expert guides will keep a respectful distance – but these bears are curious! Polar bears often come right up to Tundra Buggy, stretching to the windows for some “Buggy Love”. The vehicles keep a safe distance and provide amazing photo opportunities! Churchill has a lot to offer. From dog sledding – or dog carting before the snow – to cultural presentation and visits to museums. You will depart Churchill feeling like you’ve experienced the true north. On this adventure, the number of passengers is limited to make sure everyone gets a window seat. Onboard the Tundra Buggy enjoy plenty of room for photography and a chance to really get to know your guide. Your polar bear adventure begins! Discover Winnipeg before meeting your interpretive polar bear guide this evening. Visit the Forks – Winnipeg’s gathering place with nine acres of activity, restaurants, shopping and interactive fun. To ensure you are comfortable in Churchill's cold temperatures, ask us about how you can book winter clothing rentals. Options include Canada Goose parkas and snow pants, plus Baffin snow boots. We highly recommend you do this early, as availability is limited! Today you board your plane for a flight from Winnipeg to Churchill. Flying over the tundra the bird’s eye view is spectacular! Enjoy a guided tour of the town, including a visit to the Itsanitaq Museum – a memorable introduction to the unique culture of the north. In the evening, enjoy a cultural presentation featuring life in Churchill. Explore the Tundra for Polar Bears. Why is Churchill the Polar Bear Capital of the World? Large numbers of polar bears congregate near town each fall while they wait for ice to form on Hudson Bay. 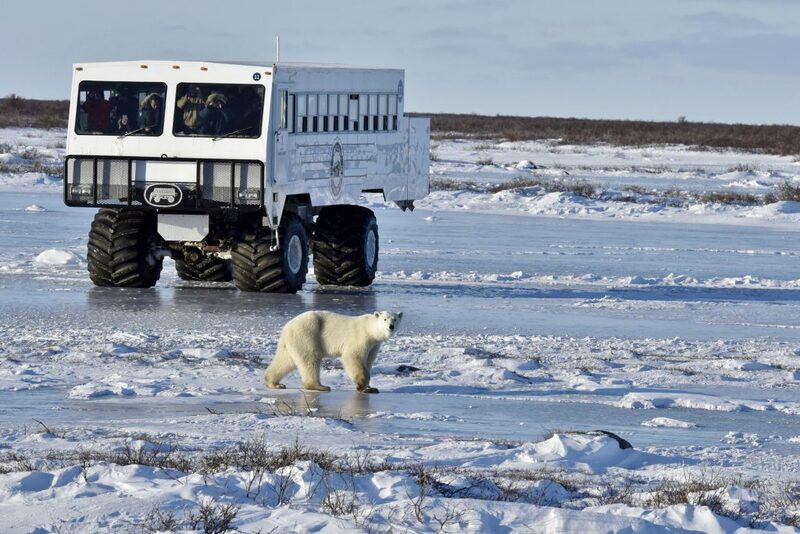 Exploring on the Tundra Buggy, seeing the bears at close quarters is almost guaranteed! Head out for another exciting day out on the Tundra searching for Polar Bears. It's another great day out on the Tundra in search for Polar Bears today. You'll learn interesting facts about the area's geology and history as you go along on this once in a lifetime adventure. Set off on an exciting dog sledding excursion today, before flying back to Winnipeg. Learn about dog sledding today – you’ll even get to mush your own team of dogs. This afternoon visit the Parks Canada Interpretive Centre, where you learn more about the history, wildlife, and culture of Churchill. Fly back to Winnipeg for an overnight stay. Much too soon, you bid farewell to your Canadian Polar Bear experience as your Canada travel experience ends, with departure from Winnipeg. Your polar bear experience ends as you check out from your Winnipeg hotel this morning. Fresh Tracks Canada customer service – from the time you book, you are assigned your own personal Vacation Coordinator whom you can reach out to with any questions or requests. *A 5 day/4 night itinerary is also available which does not include these items. Churchill: Dog Sledding experience may be offered as a dog carting excursion depending on weather. This trip is available for departures between October and November. based on double occupancy, October 2019 departure and our base class. All aspects of the trip were extremely enjoyable. Having the extra day in Winnipeg at the beginning of our trip was very much enjoyed. All tour guides and drivers were top notch! We had the most amazing experience in Churchill – we loved it! The guides were fabulous and the tundra buggy was warm with one seat for each of us. Fabulous dog-sledding experience – I enjoyed the presentation, humor and hospitality. The wine-tasting was cozy and a lovely touch – listening to fascinating stories of life as a fur trapper. The dinners were unexpectedly gourmet. Our trip was, in a word brilliant. We think the organization was excellent, and everything ran very smoothly. The guide was great and looked after everyone very efficiently. Indeed, he added to the experience as not only did we see the polar bears it was actually very educational too. Dealing with Fresh Tracks was great. Being in the UK this was by e-mail. Everything was brilliant and whenever I had a query it was dealt with efficiently and most importantly, very friendly. the whole experience felt very personable, not just a client! The arrangements were seamless; reservations, luggage transfers, dining, transportation – all taken care of. We just followed our expect guide! I was impressed with the helpful information that we received prior to the trip from Fresh Tracks. Everything was handled very well and the trip was terrific! We saw polar bears, had a great adventure.